ing to your notice the various methods and results which form the subject-matter of these lectures. 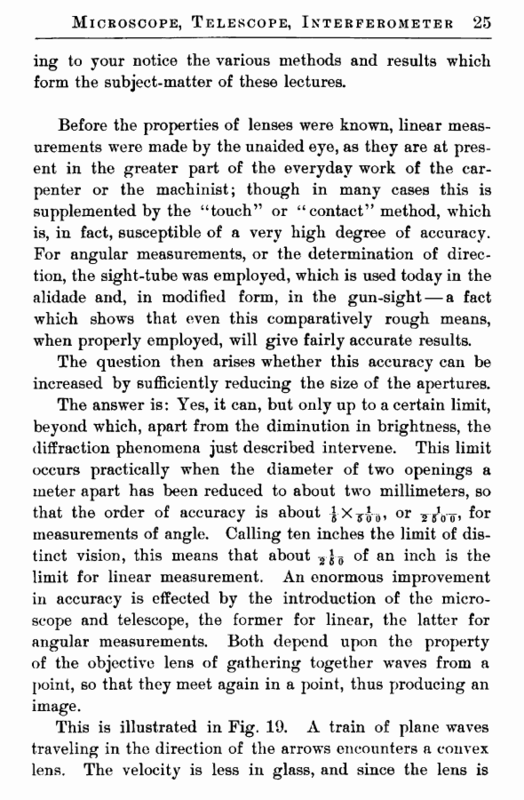 Before the properties of lenses were known, linear measurements were made by the unaided eye, as they are at present in the greater part of the everyday work of the carpenter or the machinist; though in many cases this is supplemented by the “touch” or “contact” method, which is, in fact, susceptible of a very high degree of accuracy. For angular measurements, or the determination of direction, the sight-tube was employed, which is used today in the alidade and, in modified form, in the gun-sight — a fact which shows that even this comparatively rough means, when properly employed, will give fairly accurate results. The question then arises whether this accuracy can be increased by sufficiently reducing the size of the apertures. measurements of angle. Calling ten inches the limit of distinct vision, this means that about of an inch is the limit for linear measurement. An enormous improvement in accuracy is effected by the introduction of the microscope and telescope, the former for linear, the latter for angular measurements. Both depend upon the property of the objective lens of gathering together waves from a point, so that they meet again in a point, thus producing an image. which advances toward the focus at O, and produces at this point a maximum of light, which is the image of the point whence the waves started. Fig. 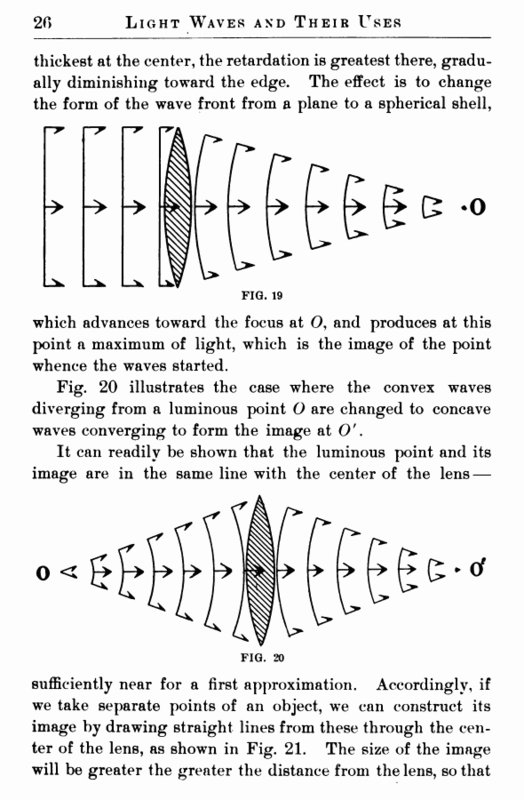 20 illustrates the case where the convex waves diverging from a luminous point O are changed to concave waves converging to form the image at O'.